Our classes are open to people and dogs of all abilities, we are focussed on fun, social agility rather than competitive training. Find out more about our Agility Classes. We offer courses and one to one sessions for basic training topics such as loose lead walking, recall, jumping up, settling on a bed, puppy training etc. 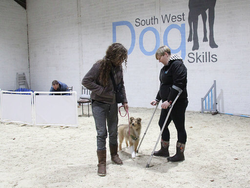 Find out more about ​Canine Coaching. We offer one to one sessions to help children (we have an adults programme coming soon) who have a fear of dogs. It's essential not to force children to interact with dogs, we work at their pace to gradually build their confidence. Visit our Dog Phobia webpage. Visit our Workshops page to see what workshops we have coming up! Sessions designed especially for children aged 7-15 years. Find out more about our Junior Handler programmes. Hoopers is a great activity to build the confidence between you and your dog, encouraging them to work at distances away from you. It is also an ideal acitivity for younger dogs, older dogs and those recovering from injury as it is low impact. Find out more about our Hoopers Classes. Held at your home these sessions provide you with a range of enrichment games and ideas to help add variety and stimulation to your dogs lives. Find out more about our Enrichment sessions. To help your puppy with their start in life, covering basic training, toilet training, settling on the bed amongst other skills. Find out more about Puppy Coaching sessions. Our brand new course - The Lucky Dip, each week an owner will pick a topic for the following week. Activities may include Agility, Hoopers, Basic Training, Proprioception Exercises, Games and Trick Training. All abilities welcome, dogs need to be 12+ months.